We've been busy skiing these last couple days. As the old saying goes "Make turns when the snow falls." Yesterday we skied Deer Valley and today at Alta with free refills both days and soft powdery turns. It's been pretty stormy out, snowing all day, with gusty winds and cold temps - your almost think it were January if it weren't for the longer days. 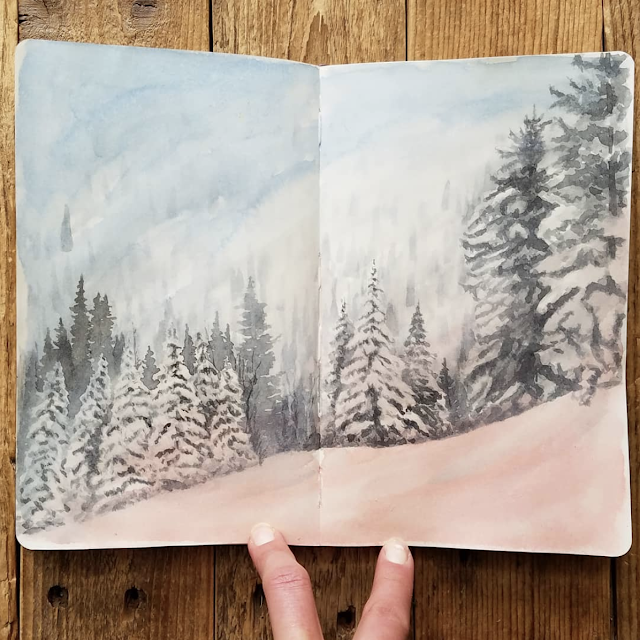 I got inspired from a picture I took yesterday at Deer Valley with fluffy, snow-covered trees. My goggles have this blue to orange fade that is more apparent during low-light conditions like this weekend, so I was enjoying seeing an alpine landscape in a color gradient. I think this might transfer over well to my encaustics too. It's funny how your goggle lens color or your sunglasses can give you a new perspective on the world.